Over 34 standard sizes; 200 of each model always in stock. 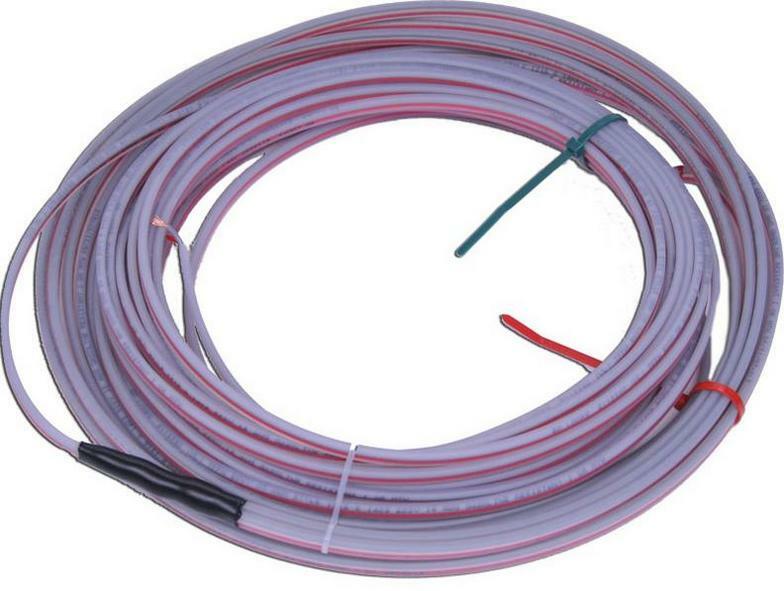 Custom loop dimensions or lead-in length are always available and can be shipped same day. Loop is packaged as a kit. Everything you need is inside the package and will save 15-30min in installation time per loop. To install a saw-cut loop, a groove must be cut. Choosing the correct size saw-blade is important to insure there is enough space for sealant to properly flow when applied. 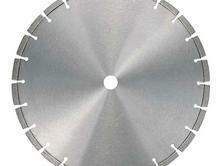 A 1/8 blade cuts a groove too narrow for thick sealant to properly flow and encapsulate the saw-cut wires. A 3/16 blade or larger has enough space for sealant to flow. BD Loops recommends the use of a 3/16 saw blade, 3/16 blades cost less, put less bog on your saw-cut machine, and require 25% less loop sealant to fill than a groove. If the sealant doesn't flow properly air pockets will form within the saw-cut groove, a leading cause in loop failures. There are a lot of methods used to clean and dry a saw-cut groove, some better than others. Cleaning and drying a groove of water and debris is very important if you want to install a loop properly according to industry standards. If a loop is installed in a groove that is wet and filled with debris the wire has a high chance of becoming nicked, and loop sealant will not harden properly or air bubbles may form. The use of a tool that centralizes air flow like the BD Loops groove cleaning air wand or similar tool is the best way to clean out and quickly dry a saw-cut groove Sucking up water and debris with a shop vacuum or using a leaf blower to dry the groove takes more time, but is more efficient that letting the sun air dry the groove. Loop sealants take time to harden you can leave the job quicker and looking nicer by always having some different colored sand on your truck. Colored sand is inexpensive and commonly found at hobby stores. After the groove is filled with sealant sprinkle some sand on top choosing a color that matches the surface material. This will allow the lane to be opened earlier, before the sealant has fully hardened. Applying sand is also a good trick if the only color of loop sealant available is black when installing into a light colored surface such as concrete. By mixing both white and brown sand the color of concrete can be mimicked and better conceal the loop tattoo.oop sealants take time to harden you can leave the job quicker and looking nicer by always having some different colored sand on your truck. Colored sand is inexpensive and commonly found at hobby stores. After the groove is filled with sealant sprinkle some sand on top choosing a color that matches the surface material. This will allow the lane to be opened earlier, before the sealant has fully hardened. 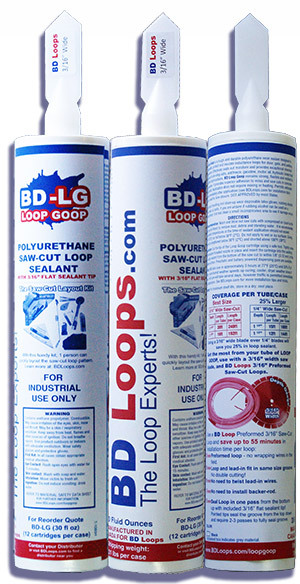 BD Loop Goop is a tough and durable polyurethane resin sealant designed to encapsulate, protect and insulate inductance loops for door, gate, and parking applications. Effectively seals out moisture and provides exceptional chemical resistance to de-icing salts, antifreeze, gasoline, motor oil, hydraulic brake fluid and other hydrocarbons. BD Loop Goop remains strong, flexible and resilient in cold weather. 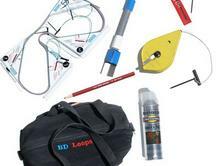 It provides superior adhesion to wires and saw cuts in concrete and asphalt. Application does not require mixing or heating. 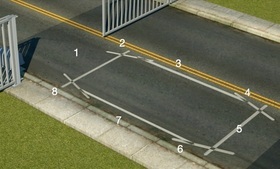 Permits vehicular traffic immediately after application (see BDLoops.com for installation tips) with no need for lane closure. DOT APPROVED by most States. The preformed saw-cut loop or direct burial loop is installed under the asphalt or concrete in the traffic lane. The loop is a continuous run of wire that enters and exits from the same point. 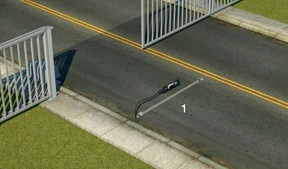 The two ends of the loop wire are connected to the loop lead in wire, which in turn connects to the vehicle detector, which plugs in to the controller board inside of the gate operator housing. The detector powers the loop causing a magnetic field in the loop area. The loop resonates at a constant frequency that the detector monitors. A base frequency is established when there is no vehicle over the loop. When a large metal object, such as a vehicle, moves over the loop, the resonating frequency increases. This increase in frequency is sensed and, depending on the design of the detector, forces a normally open relay to close. The relay will remain closed until the vehicle leaves the loop and the frequency returns to the base level. The relay triggers the proximity card reader or other like access control device to open and close the barrier gate arm operator. 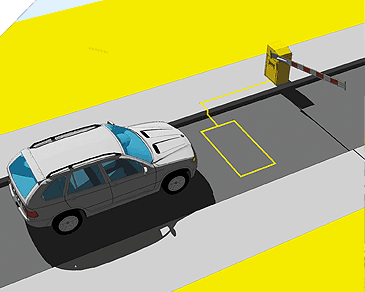 Vehicle detection loops used with inductive-loop traffic detectors can detect vehicles. Loops are used to stop or reverse a moving gate, to allow free exit from or entrance to a site, or as an "arming loop" to allow entrance. Call Christine for your amazingly low price on detection loops today. Get the Loops you need fast! Place order before 3 pm and it ships same day! 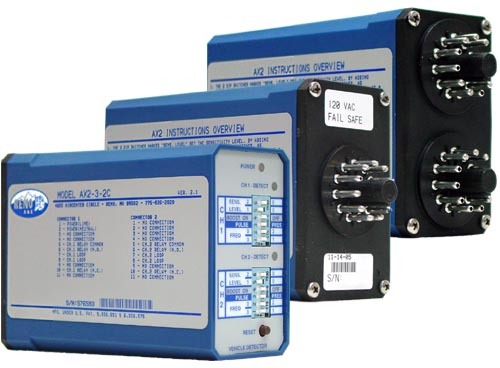 Ask about loop detectors too! 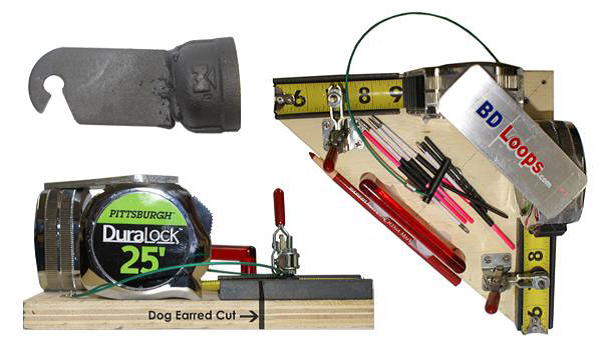 The Saw-Cut Loop Layout Kit is designed to work with BD Loops 3/16” preformed inductance loops. 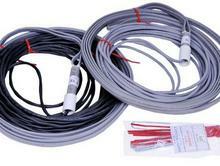 The BD Loops Saw-Cut Layout Kit uses modified measuring tapes to allow installers to quickly layout the loop pattern. The Layout Kit helps prevent the loop pattern from being cut too large for the loop to fit in. Sight sticks allow experienced installers to cut the pattern without chalking lines. If you don’t do your own cutting the kit can also be used to layout and mark cutting patterns for concrete crews to follow. 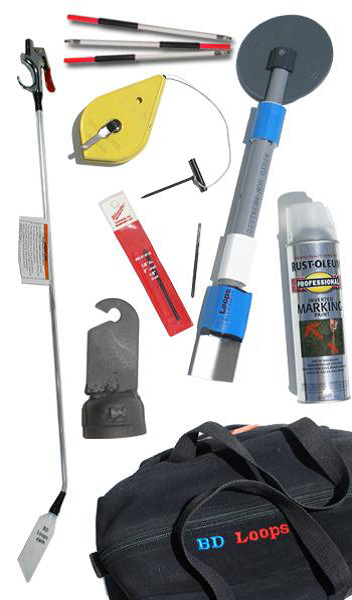 The Kit includes other time saving tools such as the Groove Cleaning Air Wand, Pizza Wheel & Wedge Tool, Clean Out Tool, and modified chalk string. Seal Loop in one pass from the bottom up with included 3/16" flat sealant tip! Pointed tips seal the groove from the top down and require 2-3 passes to fully seal the groove. The detector's compact, loop-less design reduces installation costs when compared to traditional inductive loop technology.